"This recipe is simple and affordable. 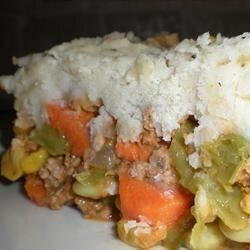 It's made up of common ingredients from the pantry- ground beef, green beans, tomato sauce, potatoes and seasonings. I'm not sure where it came from, but I know there are many variations. This is Mom's! Try serving with cranberry sauce or other fruit of your choice." Place the potatoes and water to cover in a large pot over high heat. Boil for 15 minutes. Meanwhile, brown the ground beef in a large skillet over medium high heat; drain excess fat. To the ground beef, add the tomato sauce, parsley, Worcestershire sauce to taste, salt, ground black pepper and green beans. In a separate small bowl, mix the flour with the 3 tablespoons water and stir into the beef mixture. Stir all together well. Drain the potatoes, mash and spread over the beef mixture Place 2 to 3 vent holes through the mashed potatoes. Bake at 350 degrees F (175 degrees C) for 25 minutes. Brush the milk over the potatoes for the last 5 minutes of baking. See a quick-and-easy version of beefy shepherd’s pie. Not enough flavor. And too many potatoes! To make the recipe easier, I substituted instant mashed potatoes. I also added grated cheddar cheese on top. It was a quick and easy recipe! This was a great recipe. I followed it exactly, except I added condensed cheddar cheese soup and put shredded cheddar cheese on top and it came out AWESOME! Thanks for sharing this recipe.